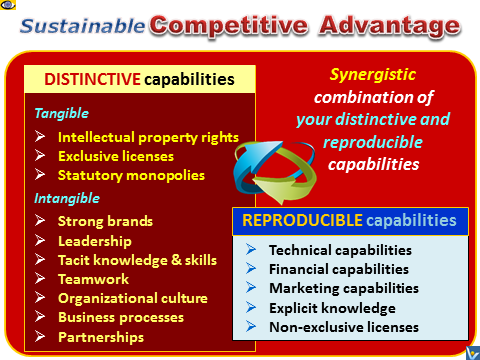 Sustainable Competitive Advantage is the prolonged benefit of implementing some unique → value creating strategy based on unique combination of internal organizational resources and → capabilities, value-creating products, technologies, processes, and services that cannot be matched by → competitors. Hypercompetition is a key feature of the → new economy. New customers want it quicker, cheaper, and they want it their way. The fundamental quantitative and qualitative shift in competition requires → value innovation , competitive differentiation and organizational change on an unprecedented scale. Today, your sustainable competitive advantage should be built upon your → core competencies and → corporate capabilities, especially distinctive ones, and must constantly be reinvented. You will never lead in → innovation or be faster to market than your competition if you depend on other for your core technology. While, according to the new standard operating procedures (SOP) and → 80/20 Principle it is advisable to get rid of and outsource everything that isn't vital to your core business, make sure that, while doing so, you don't "toss the baby out with the bathwater".